It took Nintendo of America more than a year to commit to releasing Xenoblade Chronicles, a year probably spent analyzing the reaction to the game's June 2010 release in Japan, a year weighing the costs of releasing the role-playing game in America... and, of course, a year spent making sure the Wii library was properly stocked with other games that fans of Xenoblade might enjoy. 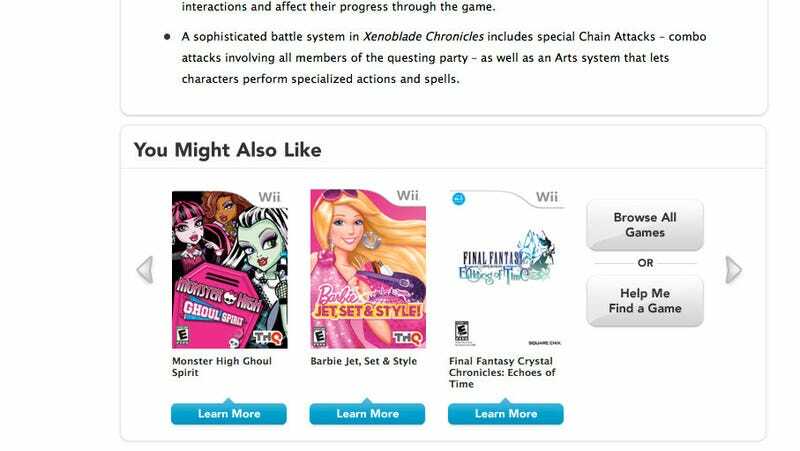 The above image was screencapped today from Nintendo of America's brand-new product page for Xenoblade Chronicles, which will be out in April, 2012. And to think, just earlier this week, we were discussing whether women and men stereotypically enjoyed role-playing games or not.